Air Traffic Controller is from Boston and features Dave Munro, Casey Sullivan, Steve Scott, Jeremy Van Cleave, Adam Salameh, and Adrian Aiello. With an eclectic song catalog and category-defying organic/electronic sound, people are taking notice of ATC. They were 2015 Billboard Hot 100 Fest performers with The Weeknd and Justin Bieber, placed on the NPR Hot 100 List for SXSW, named Guardian UK Band of the Day, and won Best Indie Alternative Song in the Independent Music Awards. Air Traffic Controller’s third album, BLACK BOX, was released on March 11, 2016. Fury Things: FURY THINGS are three quiet dudes playing loud music. In three prolific years, they’ve released three EPs, two singles and a brand new LP, all while gradually becoming mainstays in the Twin Cities music community. In December of 2015, FURY THINGS released their debut full-length, VHS, to critical acclaim from the Twin Cities and elsewhere. Lunch Duchess: Katharine Seggerman (B.O.Y.F., Bae Tigre) leads this Minneapolis-based, feminist grunge-pop 4-piece of delectable hooks and emotional catharsis. With screaming guitar lines, some actual screaming, a punchy synth, and certified-BAMF bass, Lunch Duchess will get in your head and stay there. First single coming out in early 2016, with an EP slated for release in the summer. In September 2016, Slim Cessna’s Auto Club is releasing its new album The Commandments According to SCAC. It has been twenty-four years since Slim Cessna parted ways with The Denver Gentlemen, that grand progenitor of the peculiar strain of Gothic Americana unique to the Mile High City, to form Slim Cessna’s Auto Club with a group of talented peers. The Lowest Pair: With little attention to tedious practicalities and with an eye focused securely on delivering to their growing fan base a truly special treat; a rootsy, bluegrassy, old-timish version of meiosis has happened as one new album became two new albums, Fern Girl and Ice Man, as well as Uncertain As It Is Uneven. Dead Horses: The Milwaukee-based Americana trio has crafted a timeless sound, informed as much by modern folk as it is by the classics. Front woman Sarah Vos’ gospel, living free and unapologetically, is supported with conviction by Peter Raboin on mandolin and guitar, and Daniel Wolff on double bass. 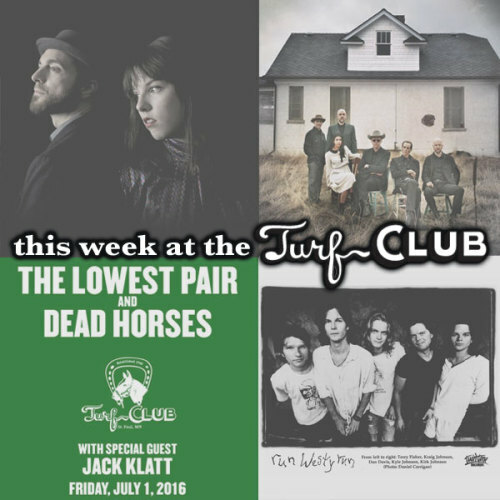 Following the release of Space and Time in 2014, Dead Horses have been touring tirelessly, from shows with folksters Swear & Shake to new grassers The Infamous Stringdusters. The hard-blasting, psychedelic art-rock band recorded two albums for famed punk label SST and another for Twin/Tone with R.E.M.’s Peter Buck and Hüsker Dü’s Grant Hart as producers. […] The Westies were better known for their famously unpredictable, adrenaline-filled live shows, the last of which was probably sometime in 1998 at the 400 Bar, though the band members themselves can’t even remember. James Buckley has been playing upright bass since the age of 10, and playing professionally in the Twin Cities since spring of 1999. Accompanied in a trio setting by pianist Bryan Nichols and drummer J.T. Bates, James displays his considerable chops as a bassist, soloist, and composer.